Summary: Sea turtles, like many other marine organisms, move among their foraging grounds and between their foraging and reproductive areas at different stages of their life cycle. For all but one sea turtle species (the loggerhead, Caretta caretta), the location of the oceanic developmental areas, the duration of time turtles spend in these areas, and how these oceanic areas connect with the neritic (over continental shelf) foraging grounds remain unknown, resulting in many management and conservation challenges. Florida's sea turtles provide an excellent opportunity to learn more about the distribution of oceanic juvenile sea turtles. Using stable isotopes of carbon and nitrogen, Reich et al. (2007) identified the type of habitat utilized by post-hatchling green turtles (Chelonia mydas) in the North Atlantic, but the locations of these developmental areas remain unknown. One possible solution to this mystery is to analyze the regional variability of trace elements in sea turtles to find the geographic location and number of the oceanic foraging areas of Florida green turtles and determine the connectivity patterns between oceanic and foraging habitats. Results: We evaluated patterns of connectivity between oceanic and neritic foraging areas of Florida’s green turtles to investigate the “lost years” of Florida turtles. We performed trace element and isotopic analyses on turtle scutes from distinct neritic foraging areas along the coast of Florida and other foraging areas in the Atlantic. A total of 181 samples was collected for this project from September 2008 through February 2011. We collected scute samples from 47 stranded green turtles (≤ 55 cm carapace length [CL]) along the coast of Florida (22 from the east coast and 25 from the west coast). We also collected 27 samples from green turtles foraging along the coast of Nicaragua between 24.7 and 52.8 cm CL; 26 samples from Union Creek Reserve, Bahamas, from 30.9 to 45.2 cm CL; and 16 samples from Long Island, Bahamas, from 26.1 to 31.8 cm CL. Samples from Brazil were also collected in Almofala in northern Brazil (n=26, 29.5 - 48.8 cm CL), and in Santa Catarina in southern Brazil (n= 22, 25 - 54.6 cm CL). Because having signatures of oceanic foraging grounds could help us determine where green turtles are going after hatching, we collected samples from 11 loggerhead turtles and from 2 green turtles from The Azores, Portugal, a known oceanic foraging ground for “lost-years” loggerhead turtles. 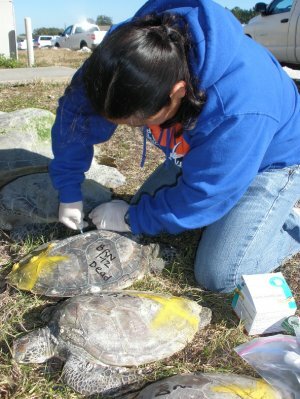 We conducted stable isotope analyses for carbon and nitrogen on the 181 samples collected to identify the oceanic layers of the scutes so that we could analyze those layers for trace elements and lead isotopes to determine if the individuals were coming from different oceanic regions based on their elemental composition. Based on the stable isotope analyses, only 144 samples out of the 181 had layers of scute with oceanic signature (133 green turtles and 11 loggerheads). These 144 samples were analyzed for trace elements, and we determined green turtle scute has measurable concentrations of 22 elements. The elemental signatures of the 11 loggerheads from The Azores were used as a baseline signature for that particular oceanic foraging ground. We used the concentration of trace elements of the 133 green turtles to determine if there was regional variability among the samples. We expected to see great variability in the elemental composition of green turtles captured in a particular foraging ground if these turtles were coming from different oceanic regions or low variability if they were coming from the same oceanic region. We conducted a principal component analysis with the concentrations of the trace elements of the green turtles to test our predictions. From the results of the trace element analyses, we selected samples that had a high concentration of lead (Pb) to run a lead isotope analysis and evaluate the usefulness of these isotopes in determining the origin of the oceanic signature more accurately. From the literature, we obtained the signatures of the two main sources of anthropogenic lead in the Atlantic Ocean – North America and Europe – as well as signatures from the Sargasso Sea, a possible oceanic foraging ground for sea turtles. The purpose of this was to compare the elemental signatures of green turtles to these signatures to determine where in the Atlantic green turtles spend their “lost years”. Our results showed that the turtles captured in the coastal foraging grounds of Florida come from different oceanic foraging grounds. Some turtles had lead signatures similar to those of North America while others had a more European signature. It appears that most of the turtles had a signature similar to that in the Sargasso Sea; however this oceanic region is influenced by both oceanic sources of lead (North America and Europe), so results should be considered with caution. Our results so far show that Florida “lost-years” green turtles use different oceanic foraging grounds before recruiting to coastal foraging areas. We are still analyzing data. We have 15 samples pending for lead isotope analysis and comparisons between lead isotope ratios and trace elements will be conducted to determine where these oceanic foraging areas are in the Atlantic. The costs of these additional samples will be covered by another grant.